A further decline in the exchange rate would be welcome news for our tourism industry, which has struggled under the high exchange rate. 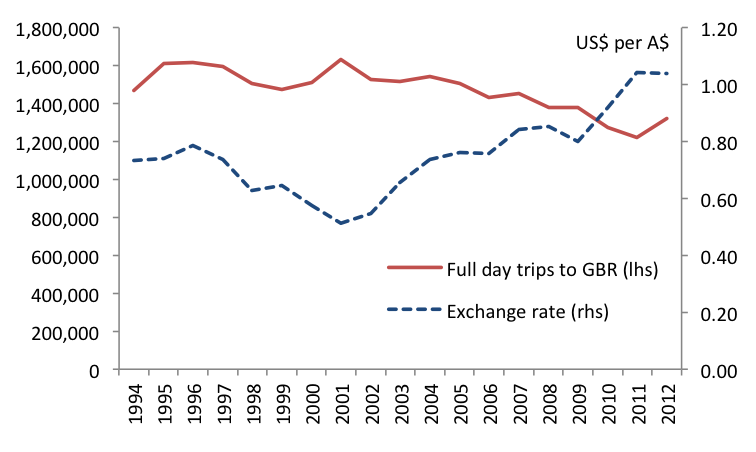 As an example, see my chart below comparing day trips to the Great Barrier Reef (GBR) (sourced from the GBR Marine Park Authority) and the exchange rate, which shows how visitor numbers dropped significantly as the Australian dollar appreciated. Airport Data: What happened in May? This entry was posted in Tourism and tagged aussiedollar, australia, australiandollar, cairns, exchangerate, gbr, gbrmpa, greatbarrierreef, hia, qld, queensland, rba, tourism. Bookmark the permalink.